Crossroads is a great song to get started in playing fast blues. Of course, it'll take a bit of time before you can play it up to speed, but you will playing it just like Eric Clapton did in the Cream era thanks to our Crossroads guitar lesson. Crossroads is a standard 12 bar blues song in the key of A. The lesson starts out by revising what the 12 bar blues actually is and what chords you need to play to play the 12 bar blues in the key of A. Afterwards, you'll learn the licks Eric Clapton plays over the chords in detail, note-for-note. Learning such riffs really helps you build your plucking technique, as you'll be using alternate picking and string skipping to play the riffs. Our Crossroads video tutorial will also teach you how to play the fast turnaround lick at the end of the 12 bar progression. Now that lick is fast, so take your time with it, Rome wasn't built in a day. 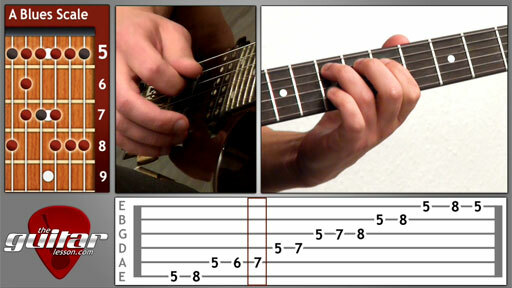 This lick will also give you a great chance to practice your minor pentatonic scale shapes, since all of the notes Eric Clapton uses are actually on the 1 box shape of the blues scale. Crossroads is actually a Robert Johnson song, originally recorded in 1937. The original Robert Johnson version is actually much different than Eric Clapton's arrangament. Eric Clapton wrote a cover for the song when he played in Cream, and recorded it live in 1968 at the Winterland Ballroom in San Francisco, and released on the album Wheels of Fire. The album was very successful, and reached top rankings across the world. Sorry, but you've reached a premium content area. The download of the Crossroads tablature file is only available to premium members. Sorry, the same goes for the backing track. To download the backing track to Crossroads, please log in and revisit this page.